With Halloween around the corner, it reminds me of my first Halloween after my divorce. I got invited to a party but felt funny going solo especially as me and my ex had always gone as a pair of something, “Ketchup and Mustard, “ Soon-Yi Previn and Woody Allen”…you get the picture. But then I realized it was a fantastic opportunity to slip into an alter identity for a night and escape my current reality. I donned a Wonder Woman costume and those gold handcuffs really set me free from all my worries (at least for one night). It was the first time I truly had a blast in a long time and reminded me that life is short and not to take things too seriously. It was a turning moment in my healing from divorce and that’s why Halloween has become one of my favorite holidays. 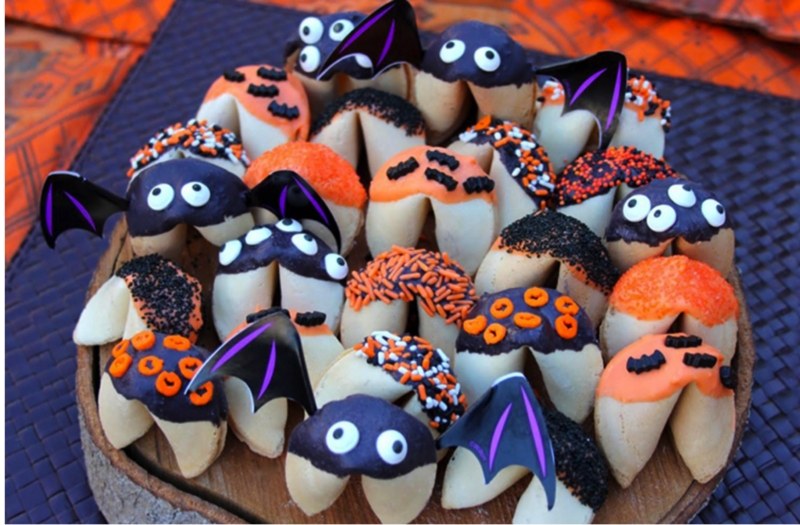 Here’s a fun recipe for spookily spectacular Halloween themed fortune cookies. Place orange candy coating and black candy coating in separate ceramic bowls. Heat orange candy coating at 30 second intervals in the microwave, stirring between each interval until melted and smooth. Set aside. Repeat steps with black candy coating. You may use a double boiler alternatively to melt candy coating. Line a cookie sheet with parchment paper or wax paper. Place toppings in individual small bowls. Dip each cookie in either orange candy coating or white candy coating. Decorate with toppings as you desire. Place on cookie sheet. Once cookie sheet is full, place in freezer for 5 minutes to set. Store in an airtight container.